Adorama has launched Glow by Flashpoint, a new brand of heat resistant light modifiers including umbrellas, diffusers and softboxes designed with superior construction and materials, including a super-strength, silver, gridded fabric lining the interior surfaces of the box that adds a crisp quality to the output. Glow Series. Glow Grand (left) and Glow HexaPop, not to scale. The Glow Grand Softbox with Speedring. Available both in 47" and 71" sizes, Glow Grand Softboxes feature a parabolic design for a light source that imitates natural sunlight. The highlight/shadow ratio is optimized with a concentrated focus of illumination from the special bowl reflector and reverse umbrella design. They combine the strength of a key light while acting as a reflector, maximizing a single light source into a blaze of directed soft light. Glow HexaPop. Available both in 20" and 24" sizes, the Glow HexaPop parabolic umbrella creates more natural, sun-like shadows and fill light. The reflector shape directs all the light in one controllable direction, while the added diffuser softens the light, bringing flattering, soft and rich color lighting to normally harsh, direct on-camera flash. It can be used as a key light off-camera with a remote trigger, or attached to hot shoe camera automation with a camera bracket and cable. We've requested the smaller versions of both and will report back when we unpack them. NEW YORK, N.Y. -- Adorama, one of the world's largest photography, video, imaging and electronics retailers, recently launched its brand new photography diffusion and accessories line, Glow by Flashpoint. Adorama's brand new line of professional studio and on-location lighting modifiers employs advanced technology designed to create perfect editorial and product still life images. Glow by Flashpoint offers softboxes in varying shapes and sizes, including the Grand Softbox in two different sizes and unique HexaPop products, which combine the flattering diffusion of a softbox with the soft focused light from the reflective, curved surface of an umbrella. All Glow lighting accessories are completely heat resistant and are designed with superior construction and materials, including a super-strength, silver, gridded fabric lining the interior surfaces of the box that adds a crisp quality to the output. Made in Korea, these new lighting accessories from Adorama are available now exclusively in the Adorama store, located at 42 West 18th Street in New York City and online at Adorama.com at highly competitive prices. Every Glow - R Series product features removable double diffusers with extremely soft, even light spread that is contrast-balanced. Reinforced support rod pockets, seams and Velcro closures make assembly and setup trouble-free. The unique Glow Grand Softboxes feature a construction of parabolic design, creating a light source that imitates natural sunlight. The highlight/shadow ratio is optimized with a concentrated focus of illumination from the special bowl reflector and reverse umbrella design. Both the 71" and 47" Grand Softboxes combine the strength of a key light while acting as a great reflector, maximizing a single light source into a blaze of directed soft light. The super even coverage is perfect for larger groups and objects. The design features exceptional light efficiency with flattering results. The Glow 71" Grand Softbox optimizes the extreme potential of studio strobes, whether covering live, unpredictable action or simply large-scale location illumination. It can also be used for typical fashion, portrait and beauty photography. The Glow 47" Grand Softbox is perfect for brilliantly lit, full-length fashion, portrait and beauty photography. By adding the gridded outer diffuser shield, photographers can transform the overall wash of sharper light into a less harsh mood. The Glow Strip Rectangle - R Series Softboxes are specifically able to isolate the glow effect, not only used as a directional soft light source but as a specialty rectangular shape in reflective and translucent objects. 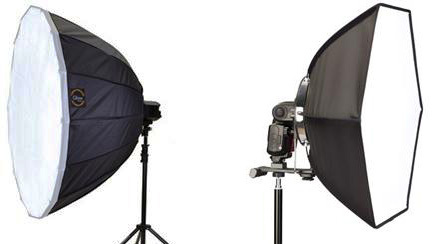 This unique, oblong softbox comes in three different sizes: 12" x 36," 16" x 48," and 30" x 60". Each of the Glow Strip Rectangle Softboxes creates a tower of light that limits coverage to create a more dramatic effect. They are ideal for photographing people in isolated light treatment where controlled contrast is desired, when working with glass and metallic objects and when sharper fall-off occurs. Glow Rectangle - R Series Softboxes are designed as the softbox standard for studio and location situations where diffused light is desired. A mainstay for any photographer's lighting kit, these rectangular softboxes are available in three different sizes: 24" x 36," 36" x 48," and 40" x 56". The remarkably even light covers larger objects in a still life setting and creates smooth fall-off effects when used as an overhead light bank on a boom. The Glow Rectangle -- R Series Softboxes from Adorama are also great as a rectangular shape in reflective and translucent objects. Adorama also offers the Glow Square Softbox - R Series, a prime "harder" soft light for studio and location shooting where diffusion is desired but richer contrasts suggest more direct lighting. While rectangular softboxes create a more "open window" look, smaller banks focus more intensity into the scene -- making the 28" x 28" square softbox from Glow a must-have lighting solution for any photographer. The ultimate one-source "people" light, the Glow Softbox Octo - R Series combines the strength of a portrait key light while acting as a soft wrap, blending perfectly with additional fill soft lights. Available in three different sizes (24," 36" and 60") the highlight/shadow ratio of Adorama's octagonal softboxes is optimized with a concentrated focus of illumination from the special bowl reflector and reverse umbrella design. The smallest of the bunch, the 24" adds slightly more "pop" to contrast due to its tight reflector spec, while the 60" is an optimal tool for mastering on-location shoots, imitating natural light. Softboxes diffuse and spread light through baffles and reflection. As the nature of the source light is more widely distributed, the light reaches all surfaces with less contrast, filling in details and shadows at the expense of ill-defined contours. Umbrellas produce soft, focused light from their reflected, curved surfaces. The sharper quality of directional light beams makes for a more seductive treatment of people and skin tones. Light aimed at the umbrella's center focal point bounces off the internal surfaces at different angles, but leaves the umbrella as parallel rays. The Glow HexaPop, available in 20" and 24" sizes, brings flattering, soft and rich color lighting to normally harsh, direct on-camera flash. It can be used as a key light off-camera with a remote trigger or attached to hot shoe camera automation with a camera bracket and cable. The lightweight HexaPop opens easily and locks to create the perfect reflector diffuser. The ultra-efficient parabolic reflector has virtually no fall-off from edge to edge. Flashpoint engineers use UV-A and UV-R diffuser materials, which are exceptionally heat resistant. The internal silver reflector fabric rivals all other flexible materials, imitating polished lame. A speedlight attaches to the speed ring assembly and aligns almost all brands of flashes. The unique six-sided shape of the HexaPop and narrow profile provides a large 105-degree light spread in a light, space-saving package. The shadows are slight and beautifully graduated. Colors are rich and vibrant without the flat pancake "flashpan" look of direct strobe. Pricing and Availability Glow by Flashpoint products are now available in the Adorama store, located at 42 West 18th Street in New York City and online at the Adorama Web site. Visit Adorama to learn more about pricing and availability. For more information on light modifiers and how they are affected by size, shape and control, visit the Adorama Learning Center.